Home News & Publications Park Librarian Wins 2013 Newbery Honor! Park Librarian Wins 2013 Newbery Honor! 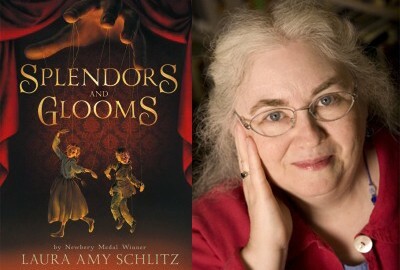 Splendors and Glooms, the latest masterpiece by Park Lower School Librarian Laura Amy Schlitz, has been named a 2013 Newbery Honor Book by the American Library Association. Park's community of readers and writers offers a resounding "Congratulations!" as well as a heartfelt "Thank You!" to Laura. Splendors and Glooms (Candlewick Press), is a Victorian gothic-thriller — darkly comic, atmospheric, intricately detailed, and exquisitely crafted. Having been eagerly anticipated and met with wonderful reviews, it has bewitched and beguiled readers in every way — and has now received this wonderful honor. Notably, Laura received the 2008 Newbery Medal for her book entitled Good Masters! Sweet Ladies! Voices from a Medieval Village. To be twice honored by the Newbery Committee is a remarkable achievement. The Park School is truly fortunate to have a treasure like Laura Amy Schlitz as a member of our faculty. In addition to the Newbery Honor Book Splendors and Glooms, and the Newbery Medal-Winning Good Masters! Sweet Ladies!, Laura is also the author of The Night Fairy, Hero Schliemann: The Dreamer Who Dug for Troy , A Drowned Maiden's Hair: A Melodrama, and The Bearskinner.